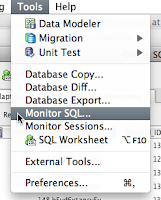 There was some a new feature added to the realtime SQL monitoring in the latest SQL Developer 2.1 staged on OTN today. 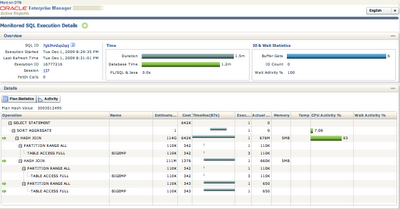 This little feature adds the ability to save the reports from the real time sql monitoring. Next you'll get a list of the SQL that has been monitored. In case your new to this feature of 11.1, this is any SQL that runs over 5 seconds and it's history is limited to 20 statements per CPU the database is running on. To get to this screen right click on the grid of running SQL and choose "Show SQL Details" This will show the state of the SQL statement you choose. The green arrows in this screen shot indicate that this current step of the execution plan the statement is on. This is VERY handy to determine if the SQL is nearing the end or just beginning. This has all been in the tool for a while now. The new part is highlighted in ORANGE. It's a simple save button to save this screen to an HTML file. Once you save the file and open in a browser, you'll get a saved version of that same screen. You can then mail or post this resulting file where the person responsible for the SQL can get it and address an issues.